Known as "Music City, U.S.A." Nashville is the home of Country Music. The famous honky-tonks along Broadway are known for live music from morning until late at night by talented performers with big dreams, along with surprise appearances of some of the music industry's biggest names. The Ryman Auditorium, known as the "Mother Church of Country Music" is an iconic red building just off Broadway that originally opened as the Union Gospel Tabernacle in 1892. Later, it was the original home of the "Grand Ole Opry" and today it is a destination for intimate performance in a one-of-a-kind setting known for out-of-this-world acoustics. Throughout the city there's a number of museums and attractions dedicated to preserving the history of the city's music industry including the Country Music Hall of Fame and Museum, RCA's Studio B, The Johnny Cash Museum, and the Patsy Cline Museum. But there's much more to Nashville beyond the music industry. History enthusiasts can explore a variety of sites including Belle Meade Plantation (complete with a winery), Civil War Battlefields near Franklin, and Andrew Jackson's Hermitage provides guests the experience to go back in time to visit the former president's entire estate. Love wine? There's vineyards and tasting rooms nearby. Interested in seeing a full-size replica of the Parthenon? There's one right in the Nashville city limits. And of course there's the food scene in Nashville. As the city expands, so does the choice of restaurants. From long-time local favorites like the Loveless Cafe and Puckett's serving classic Southern dishes, to new Southern cuisine at The Southern, to fusion dining options and culinary experiences, Nashville offers foodies a one-of-a-kind destination. When visiting Nashville, there's a variety of luxury hotels throughout the city. For those attending events at the Bridgestone or Music City Center, or looking to take in live music at Broadway's honky-tonks, downtown and SoBro hotels offer ideal locations. If the food scene and luxury boutiques is of interest, The Gulch is a prime location situated right between downtown and Music Row. While the Vanderbilt area is close to Music Row's publishing houses and recording studios, as well as multiple universities and Vanderbilt Hospital. 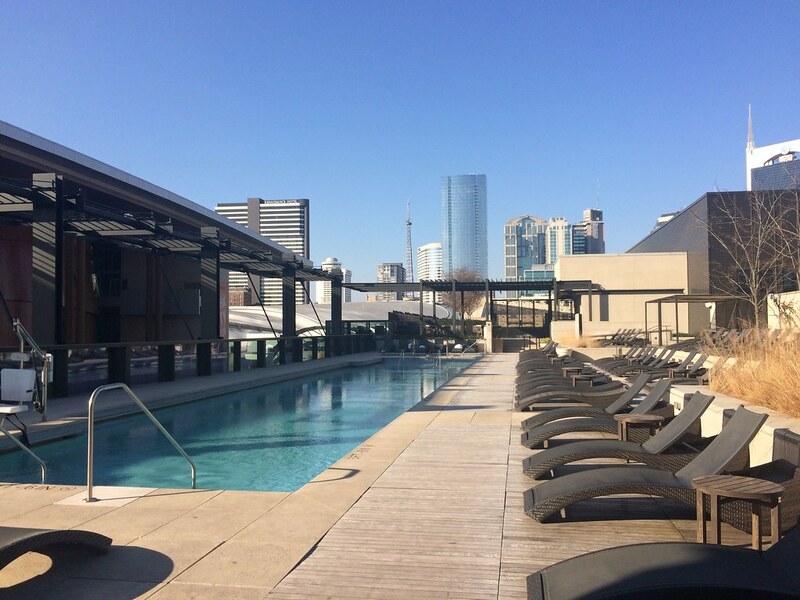 Located in "The Gulch", the trendy and upscale neighborhood set between downtown and Music Row, Thompson Nashville is a modern boutique hotel. 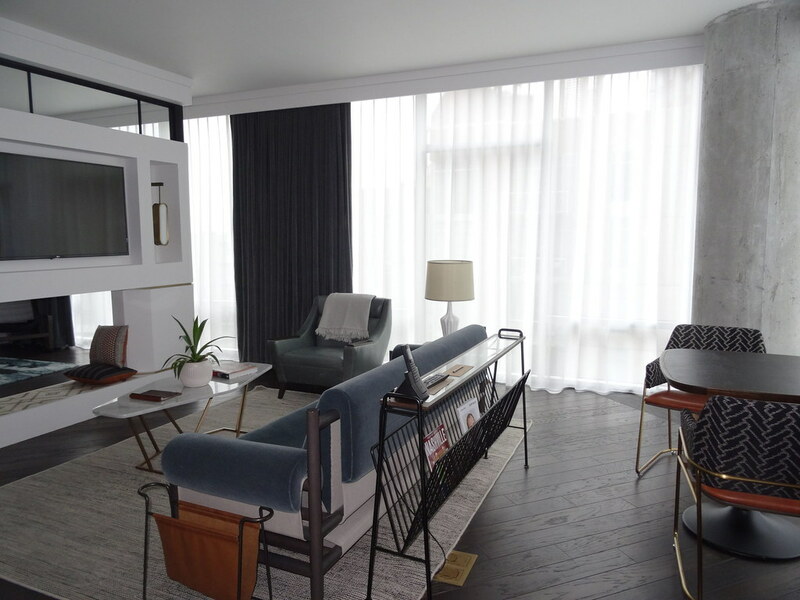 Offering guestrooms and suites that mix contemporary, industrial, and classic design, the hotel provides a residential feel. Steps from some of the city's top restaurants, boutiques, and condominiums, the chic retreat is around the corner from the iconic Station Inn. The Marsh House Restaurant serves Southern-infused seafood specialties for breakfast, lunch, and dinner, plus the rooftop L.A. Jackson has small plates, crafted cocktails, indoor and outdoor seating, and a see-and-be-seen environment. 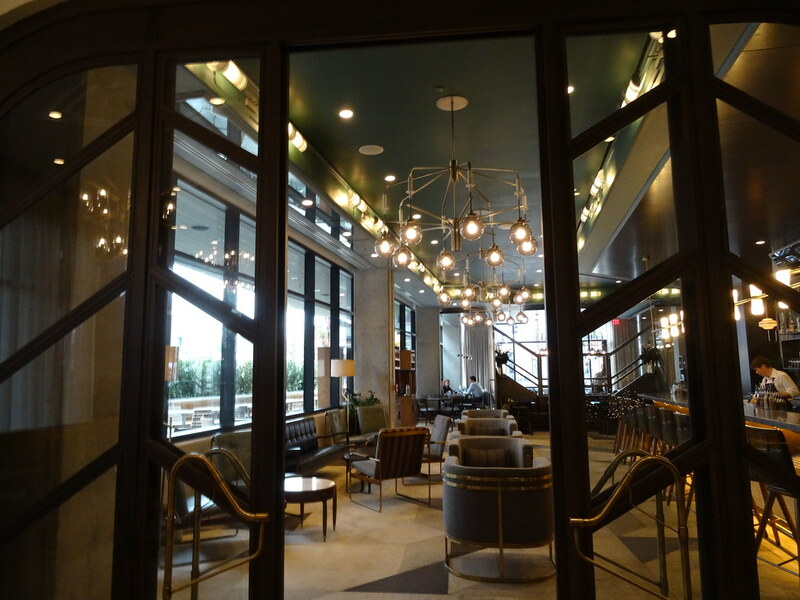 Situated in SoBro, the Omni Nashville is connected via an indoor walkway to the Country Music Hall of Fame and Museum. 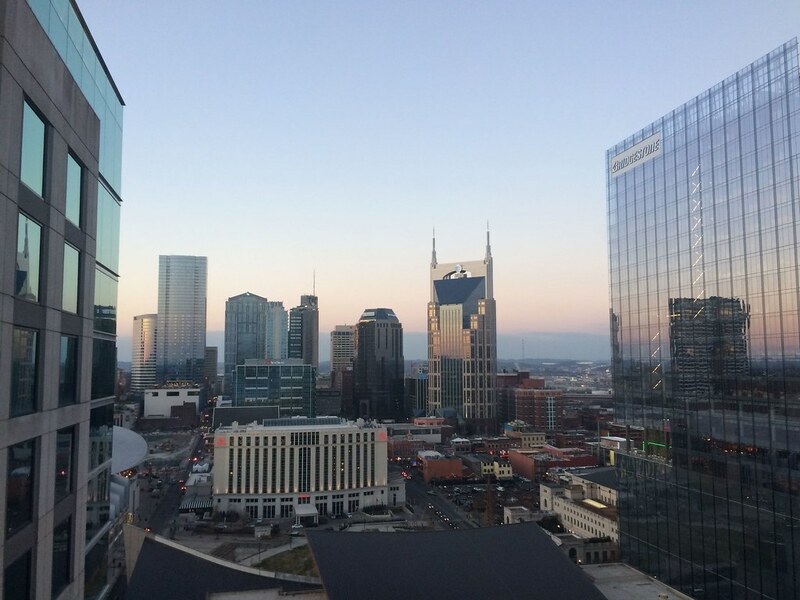 Throughout the hotel there is an array of locally-produced artwork, guestrooms and suites have Nashville-infused decor, and the heated outdoor pool is open year-round with stunning skyline views. There's three on-site dining options ranging from the casual Kitchen Notes with modern Southern cuisine, Bob's Steak and Chop House with a music-infused classic steakhouse setting, and Barlines with live music, gourmet bar foods, and a cocktail menu highlighting Tennessee libations. Since opening in 1910, The Hermitage (named in honor of Andrew Jackson's estate) has been an iconic destination in downtown Nashville for traditions, weddings, political, and social events. Offering elegant Southern style, guestrooms and suites have an average of 500 square feet, as well as traditional furnishings with dark woods and gold accents. The hotel's Capitol Grille is a destination restaurant known for creative interpretations of Southern specialties, while the adjacent Oak Bar has Nashville's largest collection of bourbons. Offering fully-equipped Writer's Rooms and creative spaces, Hutton Hotel is a boutique hotel in Nashville's West End neighborhood. Close too Music Row and Vanderbilt University, the property provides guests with an immersive journey into the city's music industry with the 5,000-square-foot Analog music and cocktail lounge (shown above). 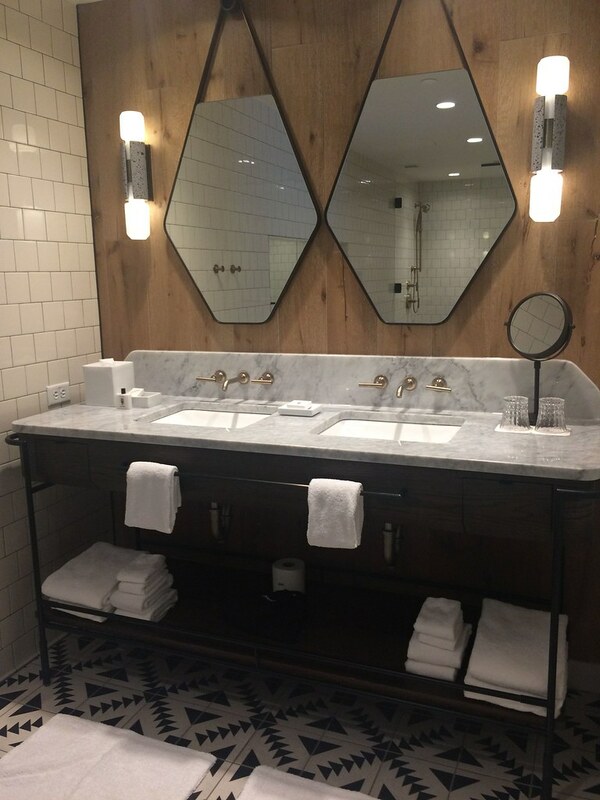 For dining, the WestEnd bar and restaurant serves innovative Southern cuisine, and recently redesigned guestrooms and suites have residential styling, granite bathrooms, and Triumph & Disaster bath amenities. 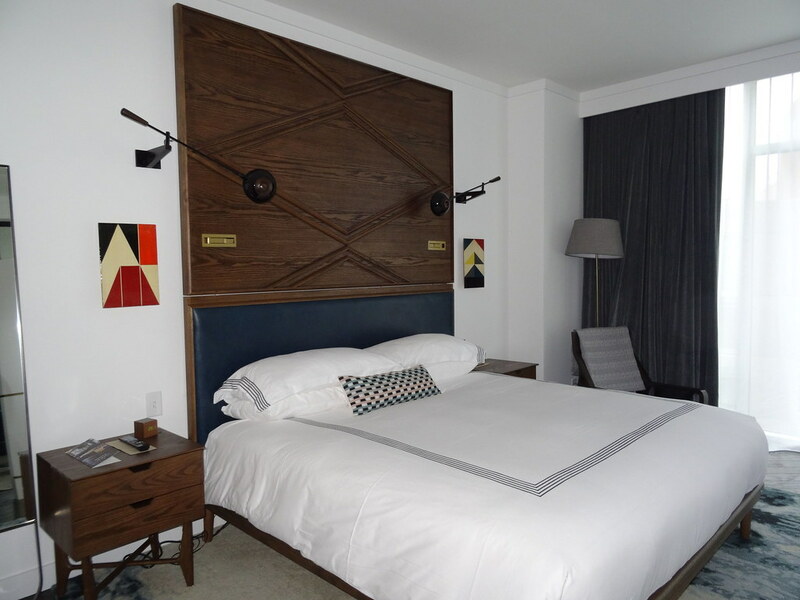 Situated within the historic Gray & Dudley building, 21c Museum Hotel Nashville offers reimagined spaces with contemporary guestrooms and suites, including rooftop suites with outdoor terraces. Located along 2nd Avenue in downtown, the property is set amidst dining and nightlife destinations, including Broadway's honky-tonks. There's a contemporary art museum within the common areas of the hotel, providing more than 10,500 square feet of exhibition and event space, plus the Gray & Dudley restaurant and bar by executive chef Levon Wallace. 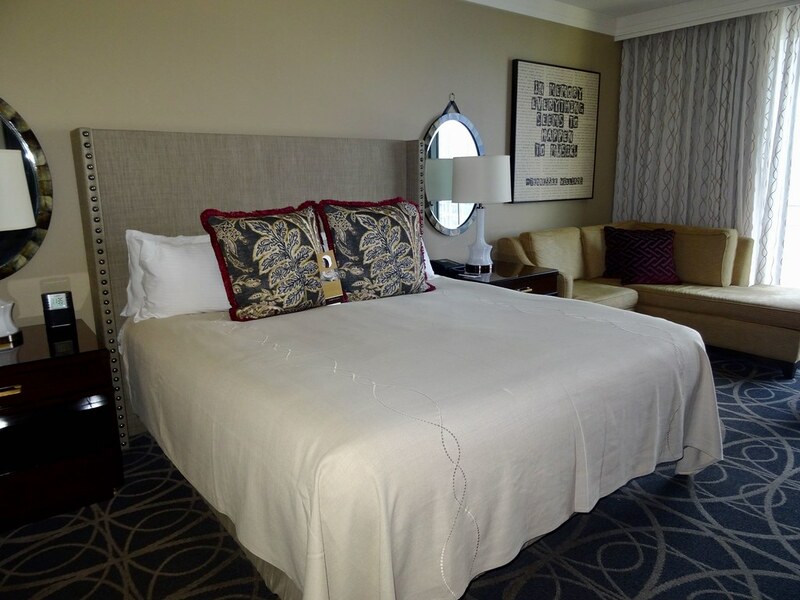 Recently I had the opportunity to stay at the Omni Nashville. 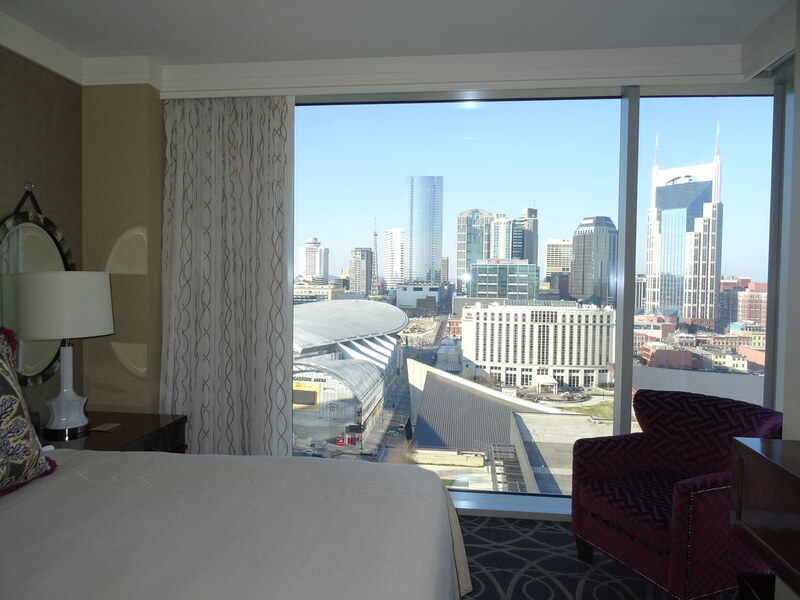 Offering an ideal location in downtown's "SoBro" (South of Broadway) neighborhood, the luxury hotel is connected to the Country Music Hall of Fame and Museum, and directly across the street from the Music City Center. 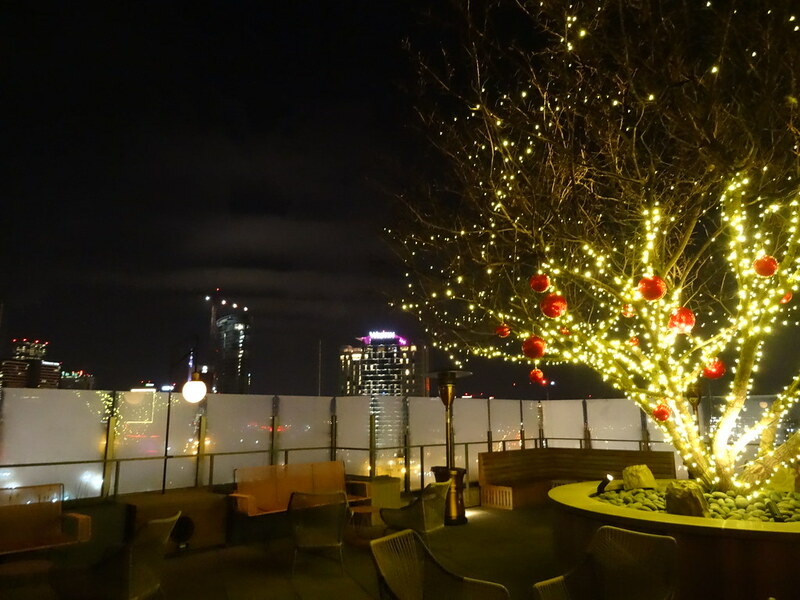 Read more below the photo of the view from the Omni Nashville. From the moment I arrived, I felt welcomed by the reception staff and the luxurious, yet approachable feel of the spacious lobby with multiple lounge areas, including one cozy space with a gas fireplace. Check-in was fast, and I was immediately wowed by the view of downtown when I walked into my room (1929). Read more below the photo of the in-room view. 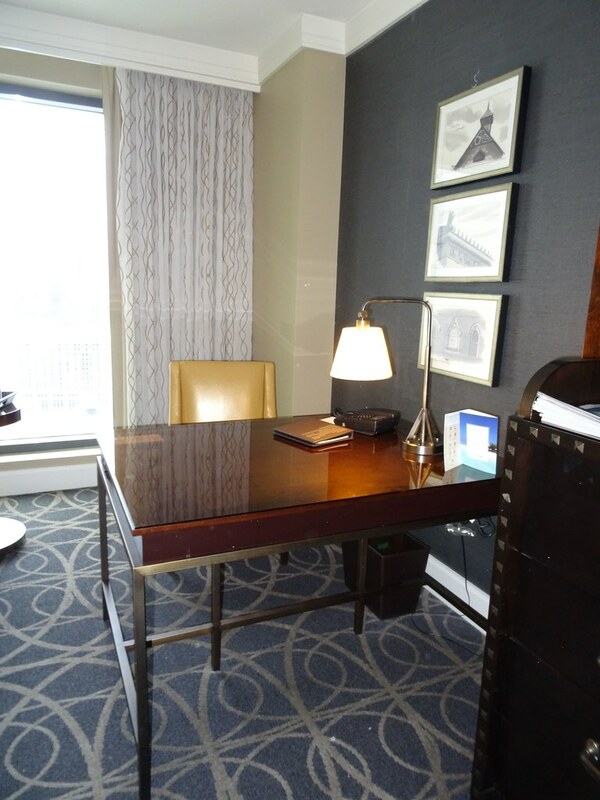 My guestroom on the 19th floor provided a Nashville-infused retreat with local artwork throughout the room, a spacious work desk, and sitting area with panoramic city views. Throughout the entire room there were electrical plug-ins, making it easy to charge a phone or electric device whether on the couch, in the plush king bed, or at the desk. Continue reading below the photos of room 1929. The bathroom was spacious with a vanity, large mirror, illuminated makeup mirror (ideal for getting ready for a night out in Music City) and a combination shower and bathtub. Read more below the photos of the bathroom. There was also a coffee bar area with coffee and tea making essentials, as well as a minifridge for snacks and leftovers. Continue below the photo below. Throughout my stay, I found the sitting area in the room to be one of my favorite features. In the morning, it was the perfect spot to sit and enjoy coffee (delivered complimentary to my room as part of the Omni Select Guest Program). After a day of exploring the Country Music Hall of Fame and Museum and downtown, the sitting area was a comfortable place to relax and sip a glass of wine while enjoying the Nashville view. Read more below the photos. 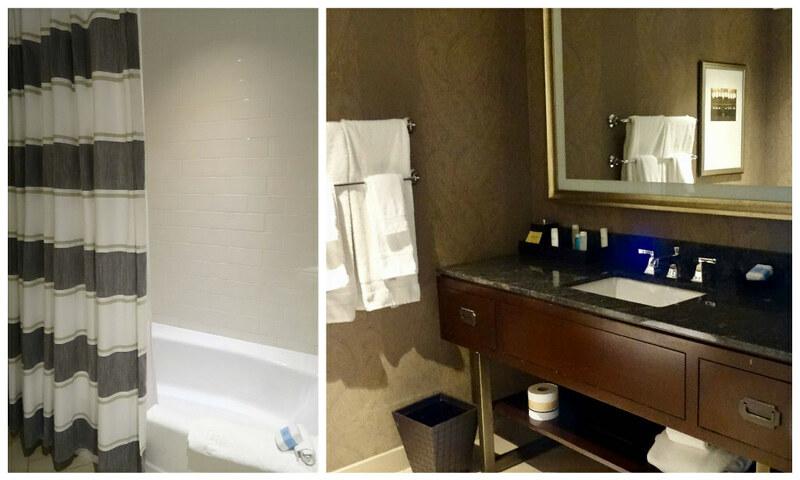 Beyond guestrooms and suites, the Omni Nashville offers an array of on-site amenities. 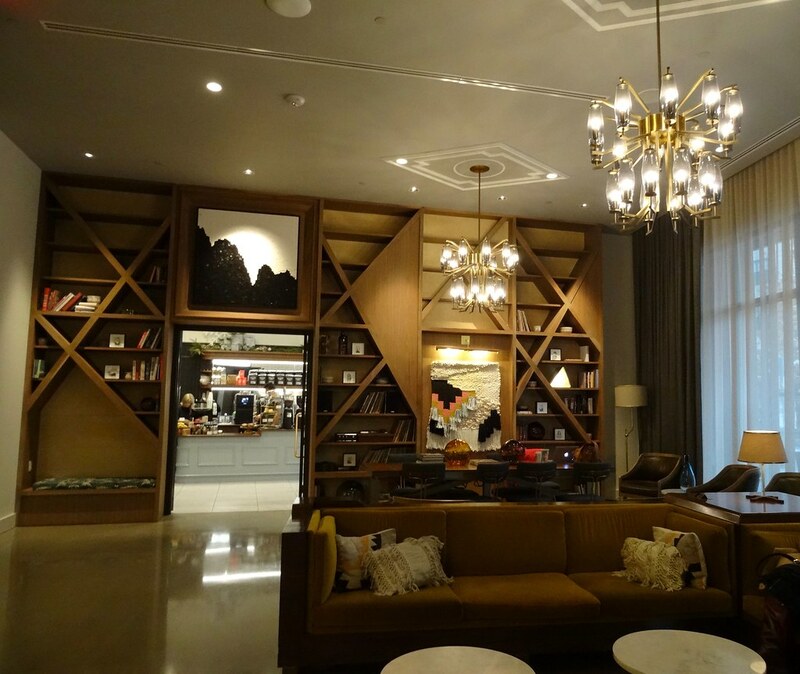 On the first floor of the hotel there's direct indoor access to the Country Music Hall of Fame and Museum, as well as the Five & TENN boutique with jewelry, fashions, and accessories crafted by local artisans, plus local food products and sundries. Lining the cooridor between the hotel and museum, there are large display cases with Music City-related displays from museums like the Patsy Cline Museum, as well as Hatch Show Print--a working letterpress shop that creates hundreds of posters and signs per year, where guests can take a tour, watch the artists in action through large windows, or purchase a poster to take home. Feeling lost? Throughout the entire property there are interactive digital screens to guide guests in the right direction. 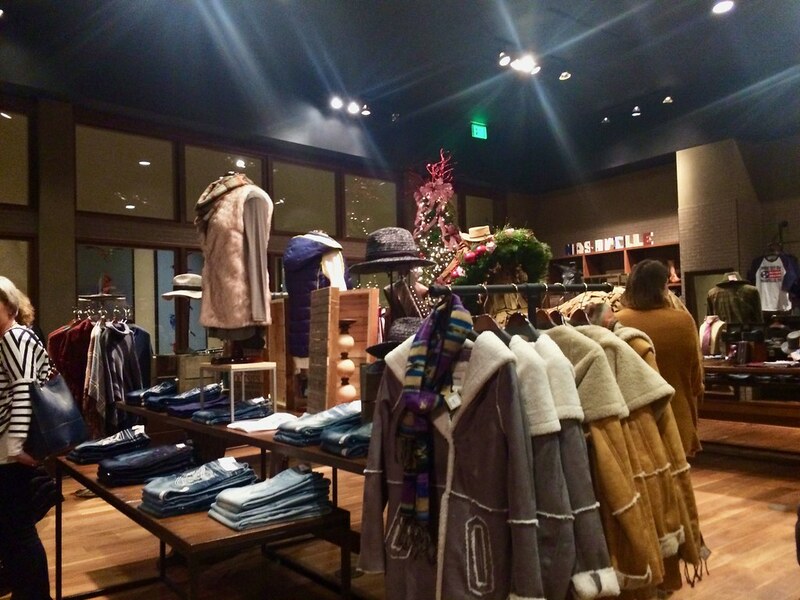 Continue reading below the photo of Five & TENN boutique. Care for a swim? There's an outdoor heated rooftop pool that is open year-round with stunning city views and lounge chairs. During the warmer months there's a full-service bar and restaurant on the pool deck, and in the cooler months there's a firepit where guests can gather round. Read more below the pool photo. Just inside the doors from the pool area, there is a large fitness center with floor-to-ceiling windows, along with a variety of cardio machines and strength training equipment. Down the hall on the same floor is the Mokara Spa providing a variety of massages, treaments, salon, and beauty services. There's also a variety of dining options within the hotel, including Kitchen Notes, serving three meals a day with a modern Southern menu and comfortable atmosphere. I started my day with Brunch at Kitchen Notes, which offered a delicious meal featuring made-to-order omelettes, Biscuit Bar, waffles, yogurt, fruit, ham, and more. There was also an a la carte menu option, as well as signature cocktails available. Read more below the Biscuit Bar photo. 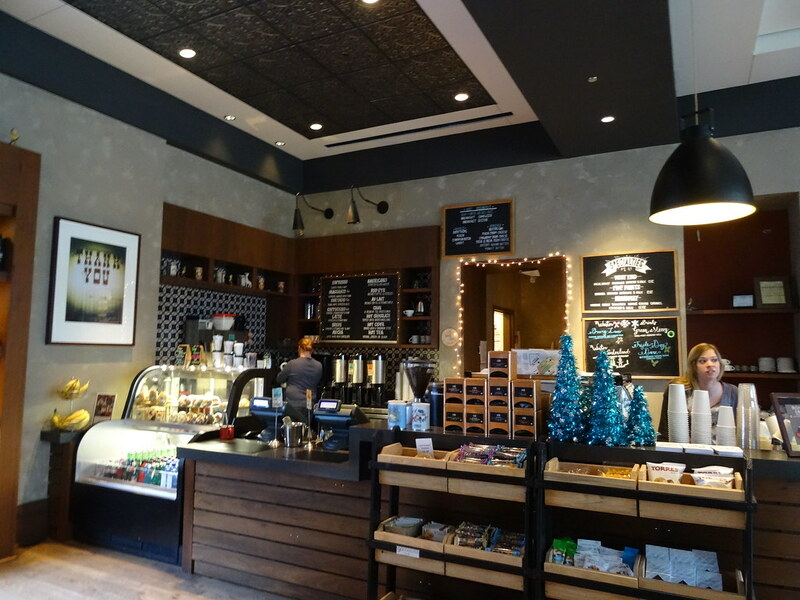 For an afternoon pick-me-up, Bongo Java is the hotel's coffee shop with a stylish setting, locally-roasted espresso, handcrafted beverages, baked items, and snacks. Continue reading below the photo. Ready for a special dinner? 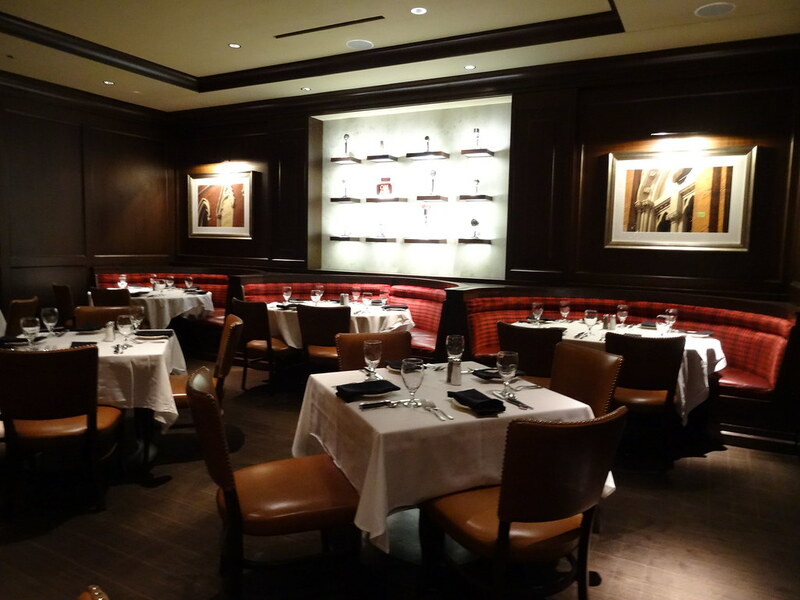 Bob's Steak & Chop House offers a discreet setting tucked behind doors just off the lobby with round booths, classic steakhouse fare, and extensive wine list (with an impressive glass-enclosed cellar in the center of the dining room). Read more below the photo. But one of my favorite features of the hotel is Barlines. Mixing aspects of a honky-tonk and a sports bar, Barlines offers live music seven nights a week, along with large screens for watching big games, a menu of Southern-infused comfort foods, and a drink list highlighting Tennessee libations. During the warmer months, the doors to the patio open letting breezes in, and the outdoor patio along 5th Avenue provides a unique setting for listening to the live music inside Barlines while looking at the lights of Music City. Steps from Bridgestone Arena, and two blocks from Broadway's famous honky-tonks, the Omni Nashville is an ideal location for travelers wanting to be within walking distance of major attractions like the Ryman Auditorium, The Johnny Cash Museum & Cafe, and the Schermerhorn Symphony Center. It's also right across the street from the Music City Center, and the property has 80,000 square feet of meeting and event space (including a theater) on two dedicated floors, making it a centralized location for business travelers as well. Recently I had the opportunity to spend two nights at the Thompson Nashville. Located in "The Gulch" the city's trendy new neighborhood set between downtown and Music Row with upscale apartments, condominiums, shops, and restaurants, the Thompson Nashville offers a convenient location for both business and leisure travelers. 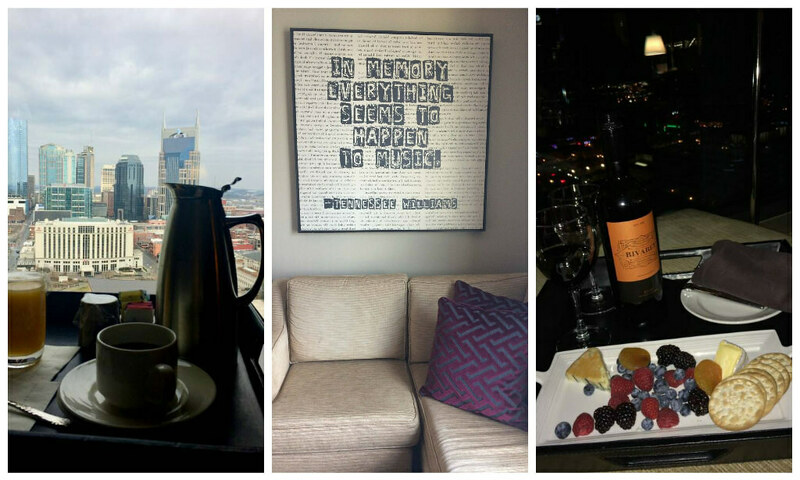 From the moment I arrived at the Thompson Nashville, I felt like I had my own private residence in the city. Set amidst modern apartments and condominiums, the Thompson offers a warm and inviting atmosphere with a lobby that feels like a chic living room with seating areas, a large table for working remotely or a casual meeting, the Marsh House Restaurant, and Killebrew Coffee with crafted espresso drinks and fresh-baked treats. Continue reading below the lobby photo. 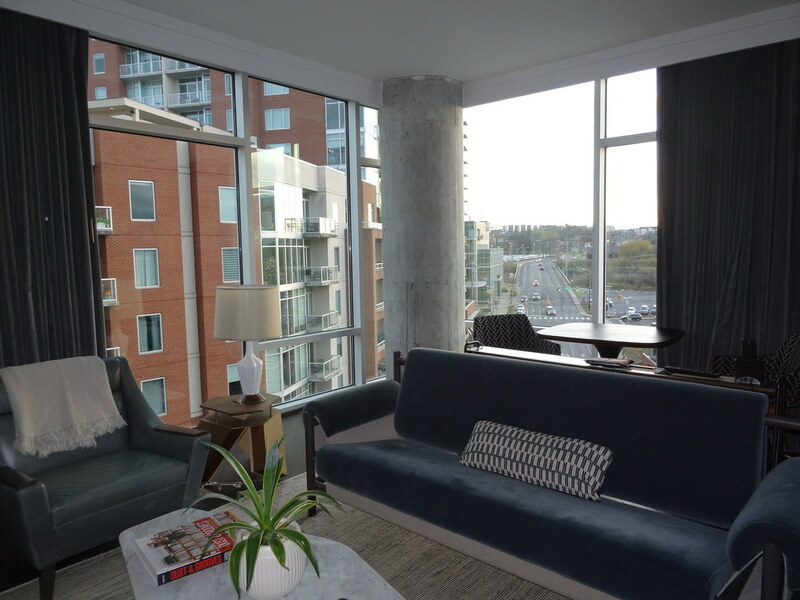 The cordial staff at the reception desk offered welcoming greetings from the moment I stepped through the revolving doors, check-in was quick, and I soon found myself at ease in my suite (701) with floor-to-ceiing windows on two sides overlooking The Gulch. Read more below the photo. In the entry there was a closet, table, and bench, providing a residential-like feel. 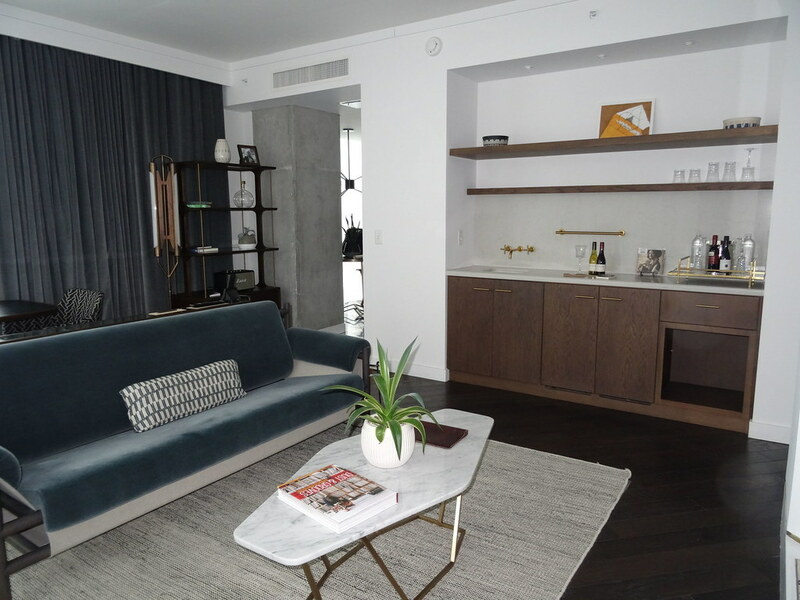 The spacious living room had wood floors, chic velvet couch and chair, wet bar, custom honor bar with Thompson signature items and locally-curated snacks. There was also an industrial-style shelf with a Marshall Bluetooth Speaker, bistro table with two chairs, and a 55-inch flat-screen TV. An added bonus...there were plug-ins throughout the suite, including in the floor making it easy to charge an array of electronic devices. 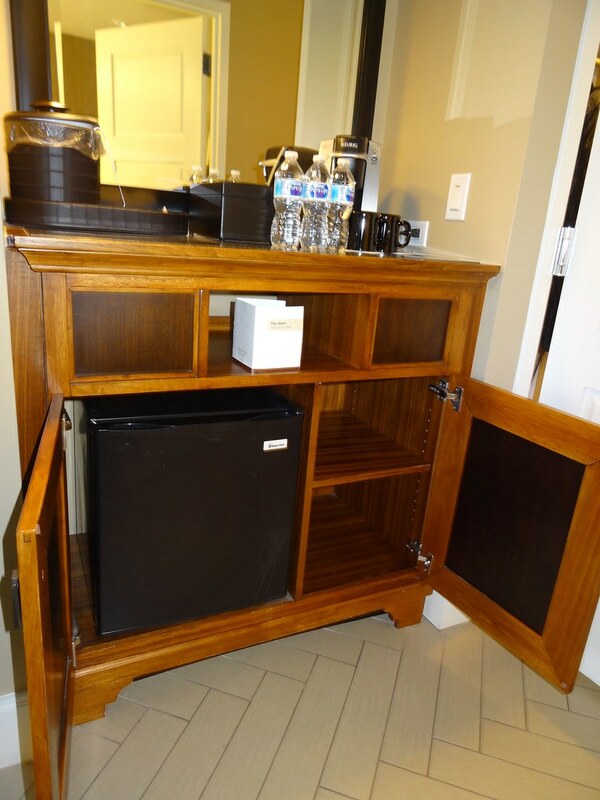 Read more below the living room and wet bar photos. Beyond the living room area was the bedroom with a plush king bed topped with SFERRA linens and a tall wood headboard with built-in individual reading lights. There was also a modern chair to sit by the window, flat-screen TV, and a large closet with a laptop-size safe and oversized Thompson signature bathrobes. Continue reading below the bedroom photo. But perhaps my favorite part of the suite was just off the bedroom through sliding barn doors...an extra-large master bathroom with a claw foot bathtub--complete with a wooden tray for a glass of wine and bath salts! There was also separate state-of-the-art double rain shower, exclusive DS&DURGA bath amenities, and a double vanity. 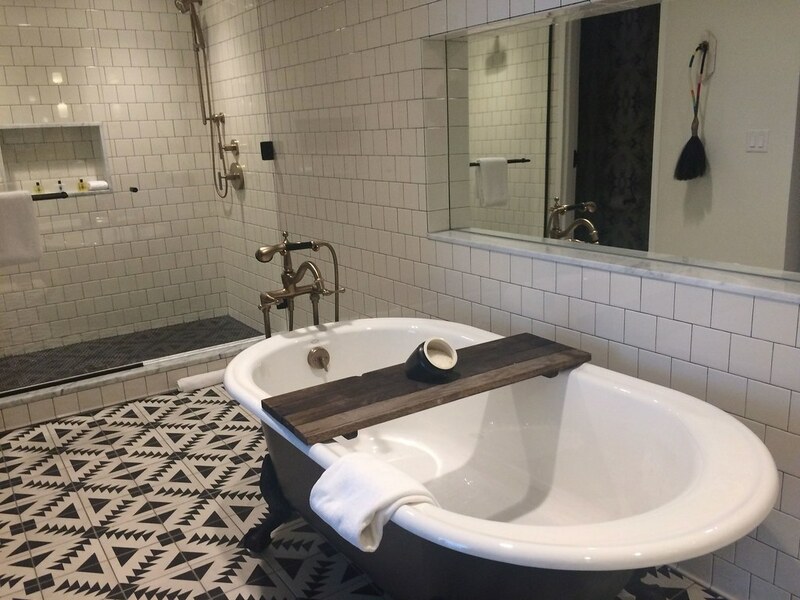 The brushed brass fixtures as well as the wood vanity and accent wall added a warmth to the beautifully tiled space, making it an idyllic sanctuary for relaxing after a day of exploring Music City. Another highlight at the Thompson the Marsh House Restaurant. 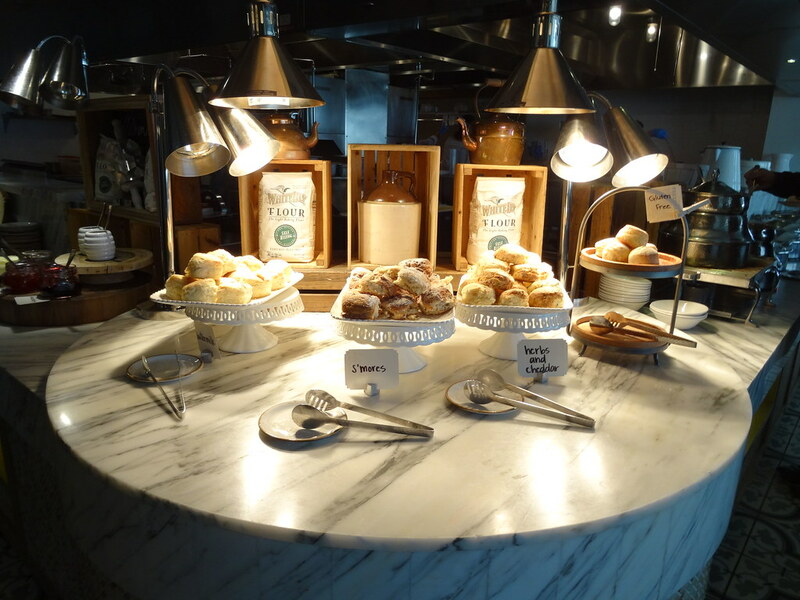 Offering Southern cuisine with an emphasis on fresh seafood, breakfast at the Marsh House was an ideal start to a day in Music City, complete with buttery, flaky, biscuits! The restaurant also serves chef-prepared lunch and dinner, as well as crafted cocktails and an extensive wine list in a modern setting with bronze hardware and plush seating spaces. 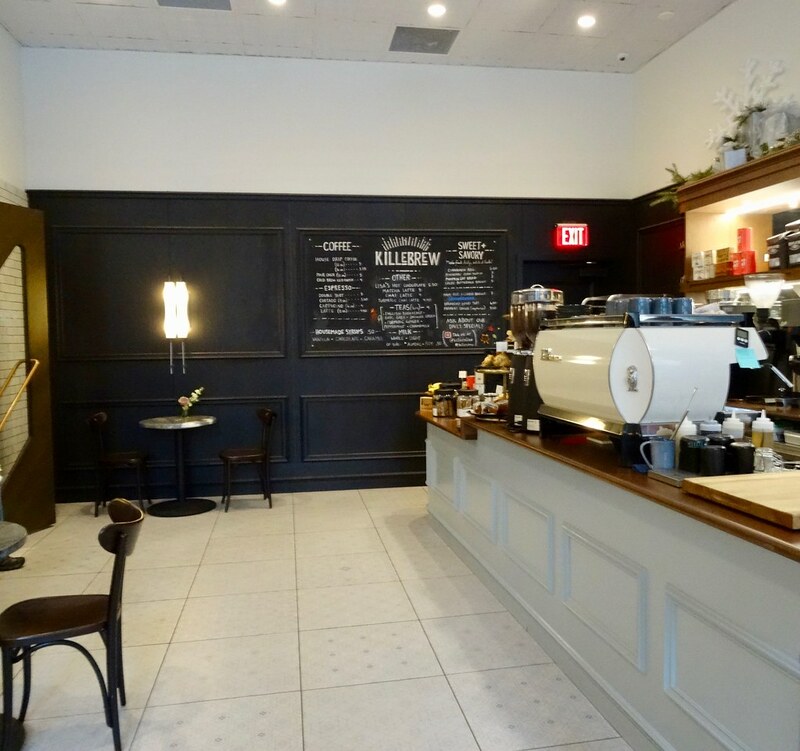 During my stay I found myself visiting the Killebrew Coffee shop multiple times for crafted lattes (complete with foam art), and a few sweat treats. Read more below the photo of the Thompson's Killebrew Coffee. I found the Thompson's rooftop bar, L.A. Jackson to be a stylish way to end a wonderful day in Nashville. The venue had large windows with skyline views, as well as a spacious outdoor patio. There was a grand bar in the center to see-and-be-seen, as well as cozy seating areas for crafted cocktails, small plates, and intimate conversation. Continue reading below the photo of the rooftop patio. In addition to my inviting suite and multiple dining options, the luxury boutique hotel offered a second floor event space with stylish meeting venues and a fitness center. Just outside the Thompson was an array of upscale boutiques, and restaurants such as the popular Biscuit Love, and the iconic Station Inn with live Bluegrass music. The property is about a 20-minute walk to the Music City Center, Country Music Hall of Fame, and Broadway's legendary Honky Tonks. Or the Music City Circuit bus stops less than one block from the hotel with complimentary transportation throughout downtown. What's a family vacation without the family pet? 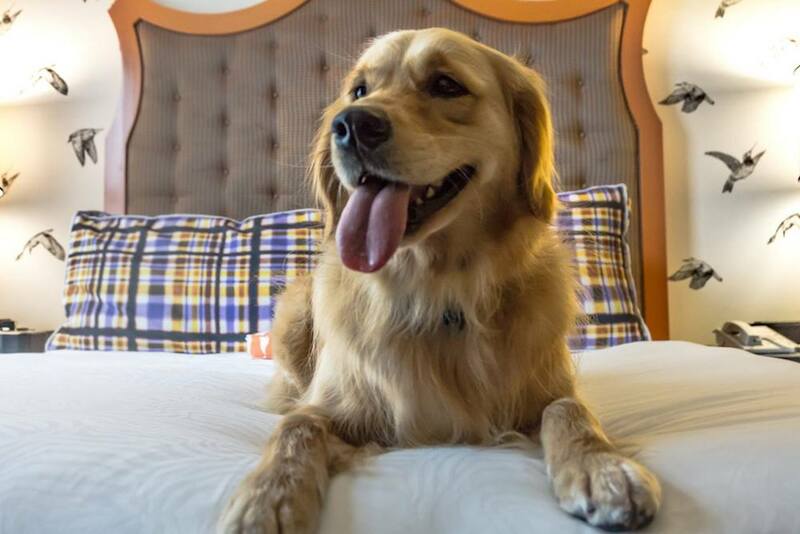 In honor of National Pet Day, we've pulled together five of the top pet-friendly hotels in the U.S.A.
Close to downtown and Vanderbilt University, the Hutton Hotel Nashville offers specially designed pet floors, along with exclusive pet amenities. The Hotel's Happy Tails Pet Program greets furry friends with Hutton Bubba Rose welcome treats, pet bandanas, welcome toys, custom Hutton placemats, bowls, and leashes to use during the stay, bedding, and a special pet-friendly room service menu. 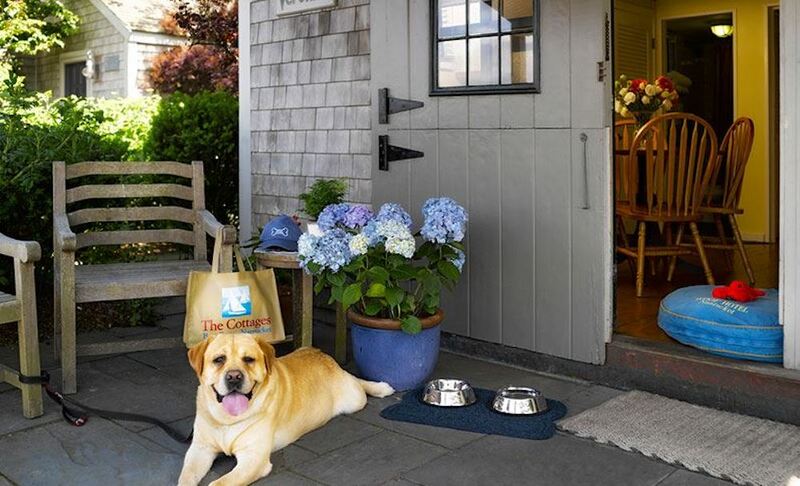 Providing a waterfront setting, The Cottages at the Nantucket Boat Basin offers special Woof Cottages along with Bailey, the Pet Concierge. When guests with furry friends check in, Bailey the Black Lab/Britney Spaniel mix is there to greet visitors and show four-legged guests to The Woof Cottages, which are equipped with pet beds, personalized pet tags, food and water bowls, plus a welcome bag of treats. There's also doggie turndown and walking services available. Offering pet-friendly chambers with porcelain watchdogs outside the doors, Virgin Hotel Chicago provides an array of in-room amenities including dog beds, food and water dishes, plus treats and Virgin Hotels bandanas. 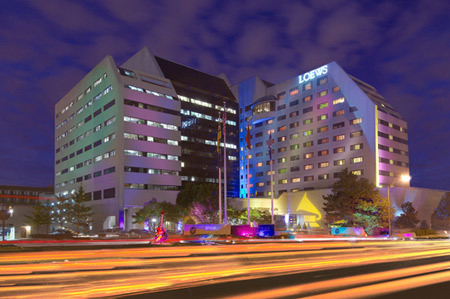 Two blocks from the Chicago Riverwalk, the hotel is located within a historic building in Chicago's Loop neighborhood. 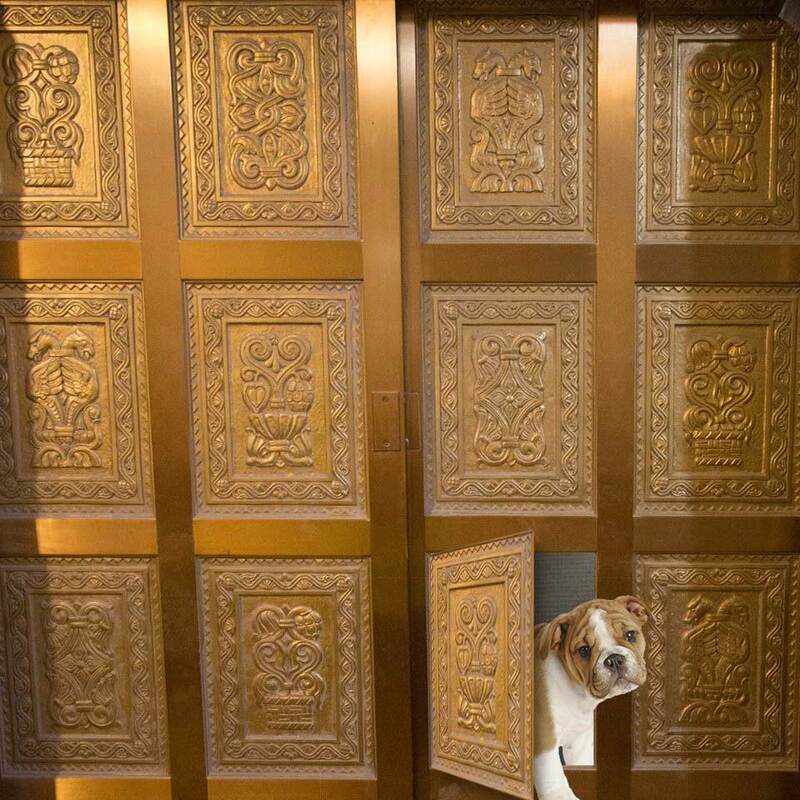 Situated within a historic 1912 building designed in Anglo-Chinois style, the Hotel Monaco Portland is a pet-friendly hotel with no size, weight, or breed restrictions. Dakota, the Director of Pet Relations greets all guests at the door, pets are welcome at the nightly wine reception, and in-room amenities include loaner pet beds, water and food bowls, plus courtesy bags for walking the dog. Don't have a pet to bring along? Guests can request companion goldfish to enjoy for the duration of their stay. 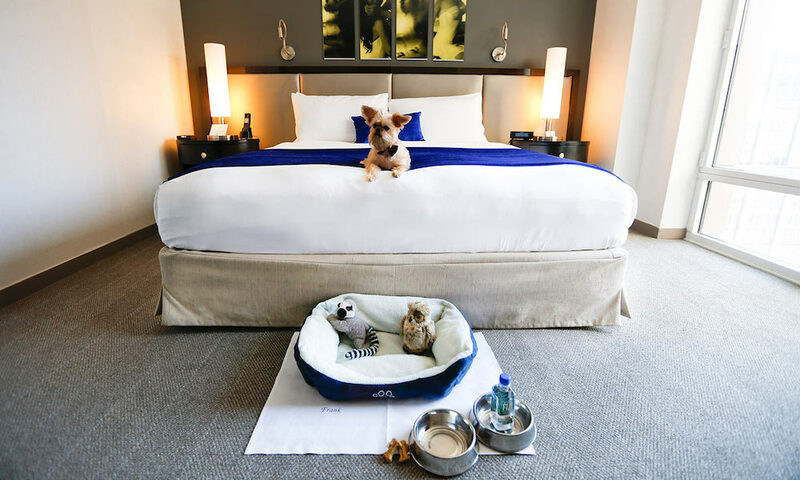 Voted the nation's "Pet Friendliest Destination" by Animal Fair magazine, the Gansevoort Meatpacking NYC welcomes pets with Lord Jameson treats at turndown, monogrammed mats with pet's names on it, food and water bowls, Fiji water, toys, and collar tags that read "I am staying at Gansevoort Meatpacking NYC." There's additional enhancements available, including name tags, puppy purses, and personalized pet beds. 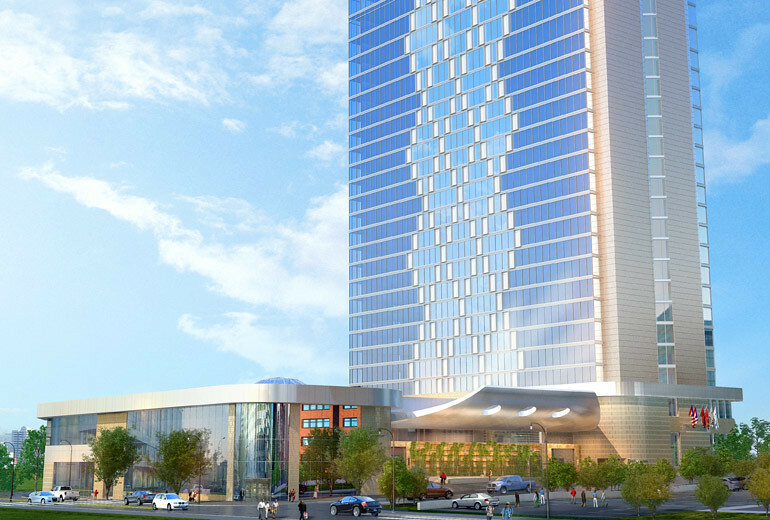 Next to the Music City Center, the Westin Nashville is set to open in late September 2016. The locally-inspired luxury hotel is the collaborative effort of two design firms. Close to the Country Music Hall of Fame and Museum, Bridgestone Arena, Ryman Auditorium, music venues and honky tonks along Broadway, the new 27-story property will offer 454 guest rooms. Ideally situated for exploring downtown, going to the convention center, or attending a live performance, hotel guests will have access to the Rhapsody Spa, and L27 - the highest rooftop bar in the region. Read more about the Westin Nashville in the article below from our sister publication, Hotel Management, by Mick Tan. 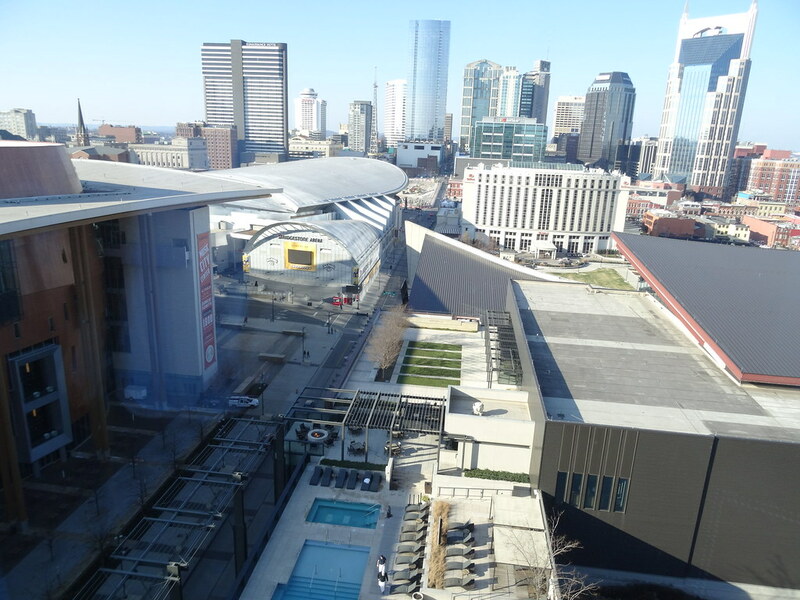 The Westin Nashville is scheduled to open this fall at 807 Clark Place. The property, which will stand 27 stories high when completed, will have 454 guestrooms and suites designed through the collective contributions of The David Mexico Design Group and Bullock Smith and Partners. The designers drew inspiration from the location of the property. The Westin Nashville will have 20,000 square feet of adaptable event space, including prefunction areas and 12 meeting venues. There will be a fitness center, two restaurants and the lobby bar. The Westin Nashville will also have L27, which will be the highest rooftop bar in the region. L27 will have a rooftop pool deck with seven cabanas. It will be able to accommodate more than 200 guests. The Westin Nashville will have the Rhapsody Spa, which will have nine treatment rooms, indoor pool, co-ed sauna, manicure and pedicure stations, and locker rooms with Experience Showers. The property will be located next to the Music City Center, Country Music Hall of Fame and Museum, Ryman Auditorium, Nashville Predators’ Bridgestone Arena and the Frist Center for the Visual Arts. 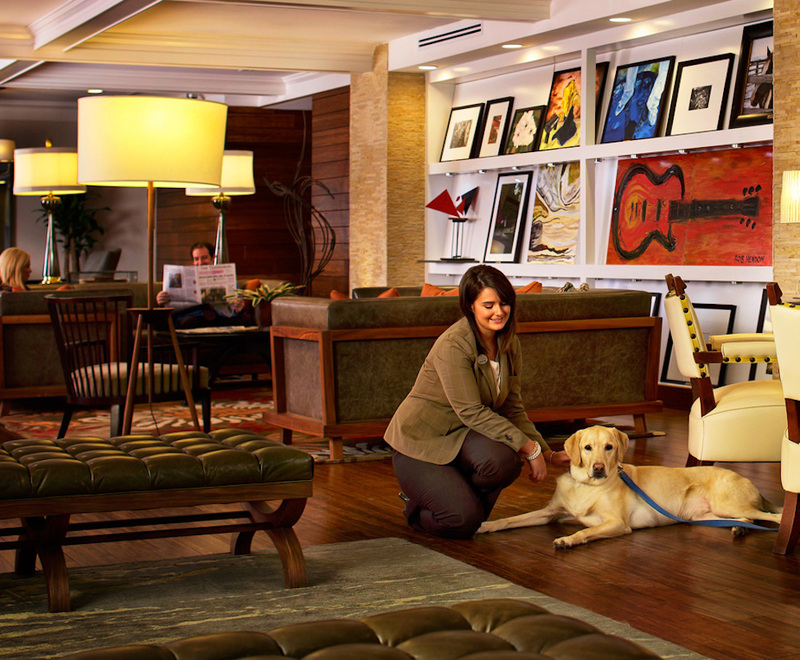 Your Questions Answered: What is the Pet Policy at The Hermitage Hotel in Nashville? We at Five Star Alliance work tirelessly to ensure we bring you the best luxury hotels selection and information regarding amenities, location, and highlights so you are confident that the hotel you choose will exceed your expectations and serve your needs. Sometimes, however, you are left with a few questions that go unanswered, and that’s why we’re here. Be sure to explore our new blog series Your Questions Answered to find answers to real questions submitted to us by our clients regarding traveling with kids, pets, the best beach hotels, and much more. QUESTION: What is the Pet Policy at The Hermitage Hotel in Nashville? ANSWER: Commissioned by 250 Nashvillians in 1908, The Hotel Hermitage (named after Andrew Jackson's Hermitage estate) opened its doors in 1910. The Hermitage Hotel was a symbol of Nashville's emergence as a major Southern city. For its first 50 years, it flourished in the heart of a city that repeatedly earned its rightful place in the nation's history books. The hotel became a social center for Nashville and a frequent stop for some of the nation's most prominent figures, from presidents and war heroes to actresses and gangsters. In June 2000, Historic Hotels of Nashville, LLC, purchased The Hermitage Hotel with the goal of creating one of the finest small luxury hotels in the world through an extraordinary renovation of the guest rooms and public areas, and a commitment to achieving an uncompromising level of warm and friendly service. There are 122 luxurious guest rooms and suites. Thoughtfully and tastefully decorated, the feel of the guest rooms is richly residential. The hotel's restaurant, The Capitol Grille, focuses on the Farm to Table concept. The 106-seat restaurant is open for breakfast, lunch and dinner, and is a true celebration of southern taste. All rates are based on double occupancy and extra person charges may apply. Please be advised that the rates, availability, as well as any extra person charges are subject to change depending on the hotel’s policies. Guests at Loews Vanderbilt Hotel Nashville got an unexpectedly early wake-up call, allegedly thanks to Olympic snowboarder Shaun White. It's been reported that White, the two-time Olympic Gold medalist nicknamed "The Flying Tomato," pulled a fire alarm at the luxury property which caused an early morning evacuation on Sunday. White fell and hit his head in the ensuing commotion, and was transported and then released from a local hospital. The evening ended for White with an arrest for vandalism and public intoxication. Let's hope the other guests requested a late check-out time.